Sandcastle Waterpark has some fantastic group rates available. On selected dates groups of 10 or more can enjoy a full days admission including Hyperzone* access and a picnic pack lunch for just £15.95 per person. For further details of our off peak packages call 01253 340745. 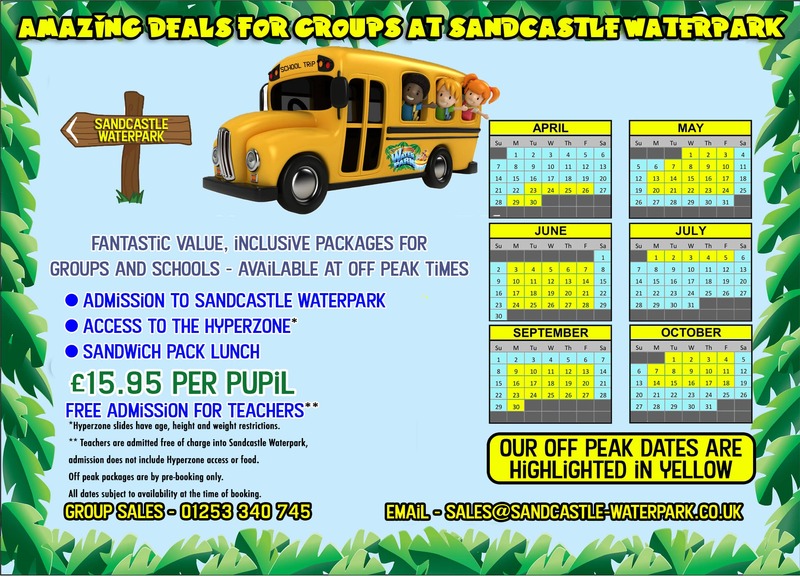 During quieter times, Sandcastle Waterpark offers a fantastic ‘off peak package’ which includes Admission, Hyperzone* wristband (*Age, height and weight restrictions apply on Hyperzone slides) and a sandwich pack lunch consisting of sandwich, crisps, cake bar and a drink. Click here to view our off peak package dates and details of how to book. Includes sandwich (choice of fillings), crisps, drink and a cake. Includes a choice of burgers, hot dog or chicken bites served with medium fries and a medium soft drink. Off peak package rates are available for schools and youth groups of 10 or more on selected dates in April, May, June, July, September and October. *Hyperzone access is restricted by age, height and weight. Our off peak packages are subject to availability at the time of booking. A minimum of 72 hours notice is required for group bookings via the phone and 8 days for an enquiry online. Groups bookings made less than 72 hours prior to arrival will require full and final payment at the time of booking. All Group bookings are subject to availability at the time of enquiry. Approx 1 hour per presentation. £50 per session. A dedicated member of the management team will show you around the waterpark and present to you on a selection of topics, including: Marketing, Guest Services, Waterpark Safety or Sandcastle Waterpark – The Business.